produced by a unique, but simple bridge. a resonator! It actually sounded pretty good. The results sound nearly as good as the "A.B.Satarmaker"
brand Tamboura I bought in San Francisco during the 60s! Very nice sound, with good volume. - First, spend an evening building a Doodle Bass version #2. Don't build the bridge or put strings on it. around .020" or .022"). The two middle strings are.010"
Most piano tuners can supply it too. usually changes the flat/string angle. Experiment. adjusted, the instrument seldom needs tweaking. motion) also works, but I don't think it sounds as good. "one beat", then the pause equals two beats. hand at all -- it is totally a drone instrument. Very neat sound if adjusted properly. 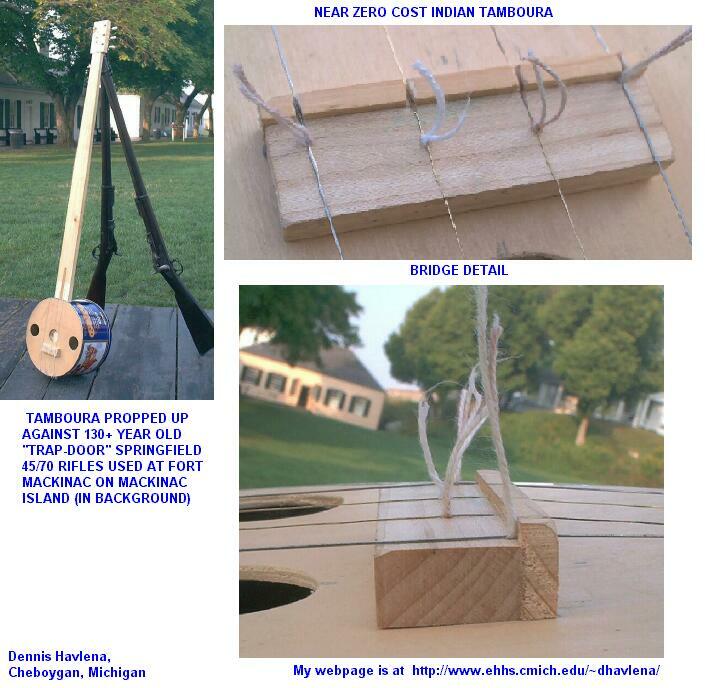 Variant spellings include: tambura, tampura, tamboura.